Lake Murray is located in the heart (center) of SC just west of Columbia. This 48,000 acre lower piedmont reservoir is owned by SCE&G and was constructed in the late 1920’s to produce hydroelectric power. At completion the lake’s 1.6 mile dam was the largest earthen dam in the world. The lake supplies the water for the 205MW Saluda hydroelectric facility owned and operated by SCE&G. 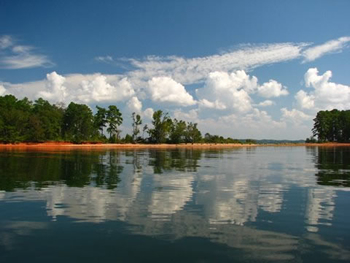 Visitors to Lake Murray can enjoy a wide variety of water sports including boating, swimming and fishing as well as other outdoor recreational activities. Fishing is one of the most popular pastimes on Lake Murray. The SCDNR is responsible for the management of the lake diverse fishery resources. This reservoir is probably best known for its largemouth bass and striped bass fishery but it serves host to a number of other popular gamefish including bluegill, redear sunfish, crappie and catfish.